Trust us, nothing can bring down the vibe that Choeur Du Roi is creating in today's #WCW. 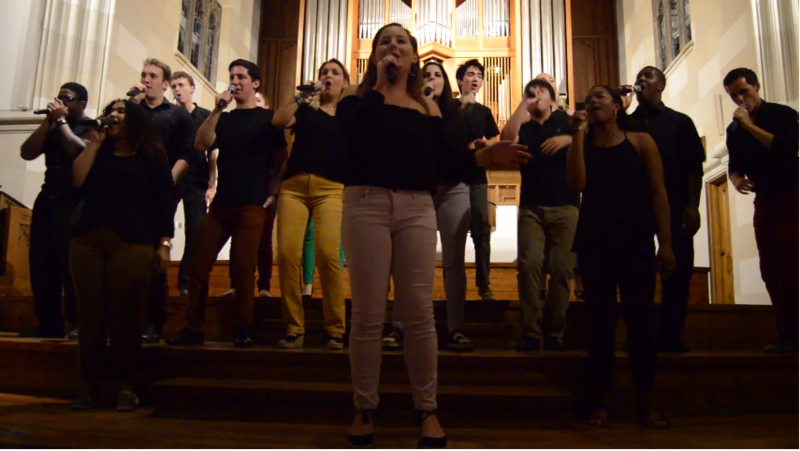 In one of their latest videos from their Parent's Weekend show, the coed a cappella group from the University of Richmond is bringing plenty of feel-good stylings to the hit Sigrid song "Don't Kill My Vibe." The performance is more than just your standard pop number too. There's vocal variety in both the lead singer and the accompanying group from dynamics to pacing. While we're sure the cover could work acoustically, without amplification, each member having their own microphone helps in creating a phenomenal blend for the group's sound. While we love a cappella flash mobs and intimate concerts with no equipment, the future of a cappella lies with each member being able to confidently perform with amplification. It works in providing the audience with every slight nuance of the arrangement. And Choeur Du Roi is proving that they're naturals on this front. Choeur Du Roi's soloist boasts a very unique and vibrant voice, which makes the song a bit playful, yet passionate. There are so many layers to what we're hearing that it can hold your attention without really having to try.